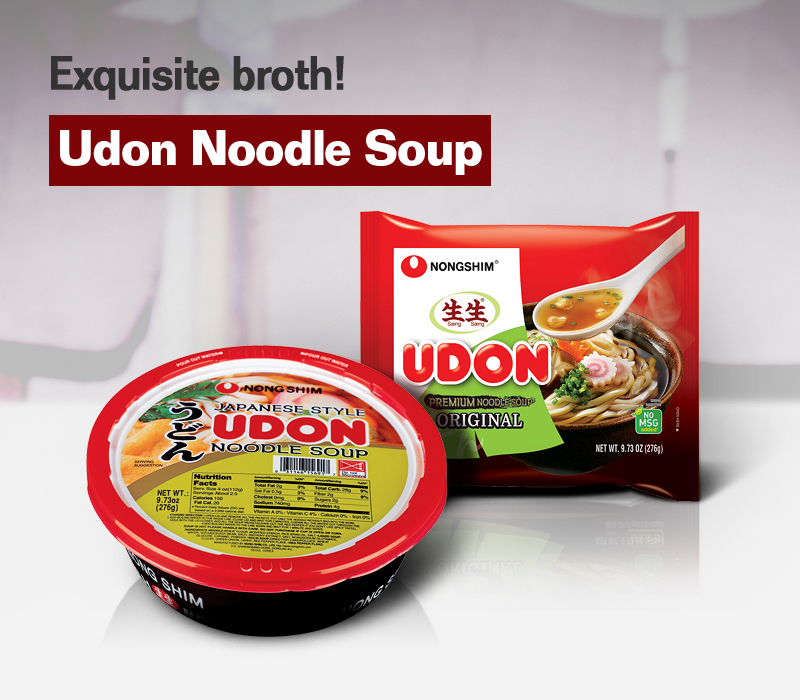 The TV advertisement saying 'broth is cool' is the highlight for Udon Noodle Soup which popularized them across the nation. Due to this ad, an unknown actress at that time, KIM HYUN JOO, became a celebrity and the phrase was parodied in various TV shows. Raw noodles of Nongshim is made by sterilizing steamed noodles with organic acid. With much moisture, the cooking time is shorter and the texture is closer to that of uncooked noodles. ※ Traditionally vinegar is added to increase preservability when making Gimbap. 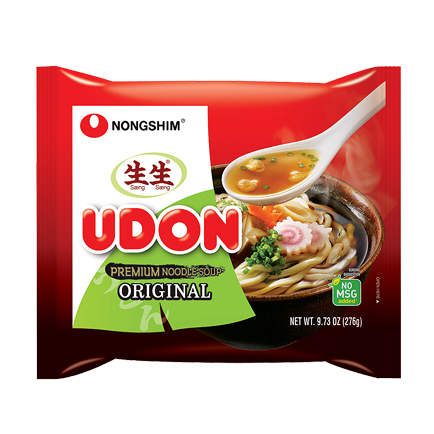 Likewise, Nongshim uses the safe organic acid(acidulant) when producing raw noodles. 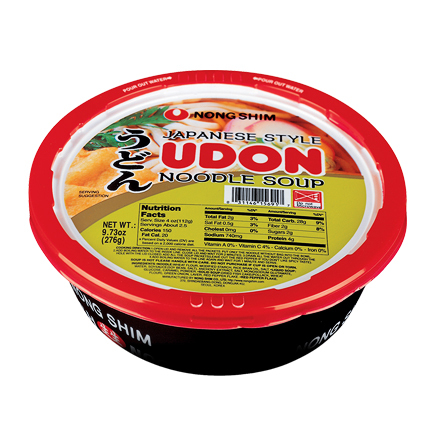 Udon Noodle Soup is not made with fried uncooked noodles. It is made by traditional udon noodles(non-fried) and katsuobushi, so the flavor is clean and refreshing. These are Japanese style Yaki Udon Noodles where teriyaki sauce is mixed with non-fried noodles. Katsuobushi enriches the deep flavor. Non-fried noodles and spicy chili oil are mixed with various seafood in the seafood Yaki Udon. Katsuobushi enriches the deep flavor. 1. Place noodles in bowl after removing from package. 2. Add enough hot water to cover the noodles. Wait for 2 minutes with lid closed. 3. Loosen the noodles slightly. Carefully drain water through the holes with lid closed. 4. Add soup base and flakes. Pour hot water up to the inside line. Close the lid. 5. Wait for 1 minute and serve. 1. Boil 400ml (about 1 2/3 cups) of water. 3. Add soup base and flakes. 1. Remove noodles from clear package and place them in container. 2. Microwave for 1 minute 30 seconds. 3. Empty flakes and sauce into container. 4. Stir well until noodles are evenly coated with sauce and serve. 1) Boil 400ml (about 2 cups) of water. Add noodled and flakes and boil for another 1 minute. 2) Strain noodles and vegetable flakes and put into pot again. 3) Add paste soup and fry with noodles for 1 minute. Place in a dish and serve.